Twice in one week, a conservancy group is posting photos of sharks who are washing ashore on Cape Cod after freezing to death in the ocean. Threshers are common in this location and the group says it is likely that the animals were stuck inside the Cape Cod Bay looking for warmer waters, but the sudden cold shock trapped them there, because outside the bay, it was even colder. 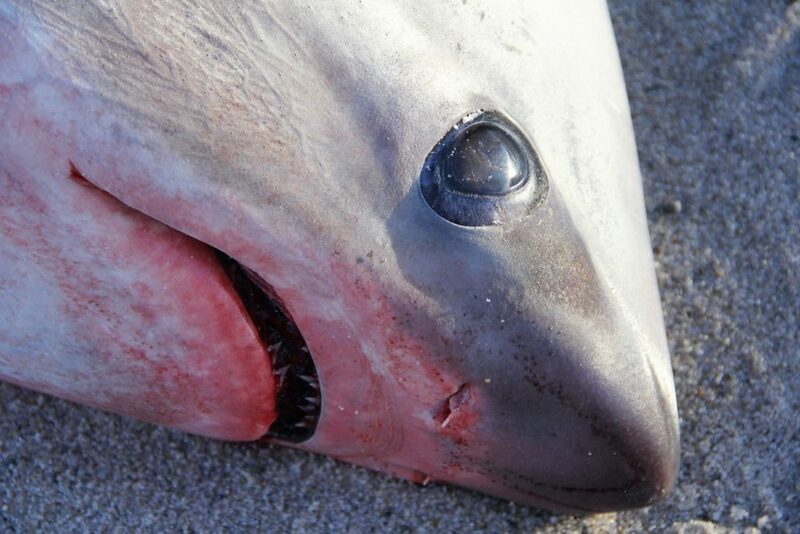 The thresher shark eats schooled fish along with squid and cuttlefish and are listed as vulnerable to extinction. They are hunted for their skin, meat, liver and as an ingredient in shark fin soup. One of my acquaintances is a shark researcher at a local university and she has gone far enough to try shark fin soup to see if the delicacy she was protesting was even any good and reported it to taste like nothing. According to comments by the conservancy, they removed the head from the animal so that they could examine its brain later. Sharks on Cape Cod aren’t uncommon and one seven-foot male shark that was stranded near the South Beach in Chatham, Massachusetts was caught on camera by beachgoers who were attempting to keep it alive long enough to be returns to the sea. The shark was stranded when the tide went out and footage shows people splashing buckets of water on to the animal while waiting for experts to attach a line to one of its fins so it would be pulled back out to the deep by the harbormaster. In all, it took about an hour to get the male back to its home. Apparently, he was too greedy looking for seagulls and didn’t notice that he was losing water depth.